In large dutch oven, cook onion and bacon or ham until light brown; drain fat. Add pork and beans, ketchup, Worcestershire sauce, brown sugar and lemon juice and stir to combine. Heat through over medium to high heat, then cover and simmer for 1 hour. 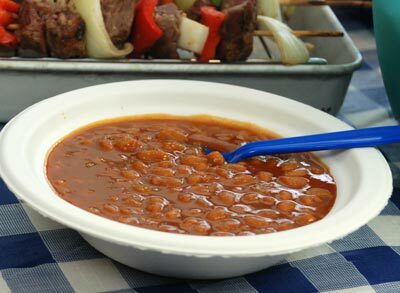 In covered overproof baking dish or bean pot, combine pork and beans, ketchup, Worcestershire sauce, brown sugar and lemon juice. Set aside. In skillet, cook onion and bacon or ham until light brown. Add to bean mixture. Cover and bake for 1 hour at 350 degrees F.